In this new section on OziDent, We provide a quick dental guide for all General Dentists to manage what might seem at first a complex case but with the correct information and knowledge should be easy mange and handle. In this article we tackle the the different causes of Maxillary Canine Impaction, Proper diagnosis, prognosis, possible treatments. The 2nd most common impacted tooth. Twice as common in females. Twice as common in the maxilla than mandible. 8% of impacted canines are bilateral. 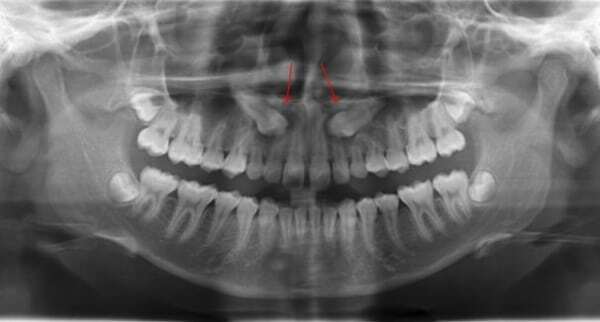 1/3 is labial located impaction while 2/3 are palatally located impactions. The main reason for impaction of maxillary canine isn’t really understood but studies showed that labially impacted canines were due to insufficient arch space, while the palatal is due to genetic or Guidance theory. Guidance theory states that distal surface of lateral incisor’s root is the guidance line used by the canine to erupt and any disturbance (absence, malformed…etc) to this surface will eventually cause an impaction. Malpositioning of the impacted tooth. Migration of the neighbouring teeth. Delayed eruption of the permanent canine or delayed shedding of the deciduous canine. Presence of a palatal bulge. Delayed eruption, distal tipping, or migration of the lateral incisor. Depending on the provided equipment a panorama X-ray is sufficient to identify the impaction type and prognosis. While if the panorama isn’t readily available 2 peri-apical X-rays in two different directions will be enough to guide you to the proper diagnosis. Has the Canine passed the midline of the Lateral Incisor. Is the Deciduous canine still present. There is sufficient space for the permeant canine to erupt. Here are a Few possible Scenarios A General dentist might face after diagnosing the an impacted canine. Deciduous Canine is still present but mobile, X-ray shows that the Permeant canine hasn’t passed the distal side of the lateral incisor, there is no root resorption, Sufficient arch space for canine . In this case, leave the case as it will normalise its self or if the child is a bit old extract the Deciduous canine. Deciduous Canine is still present, X-ray shows that the Permeant canine Has passed the distal side and the mid line of the lateral incisor, there is no root resorption, Sufficient arch space for canine . In this case, extract the Deciduous canine. ( success rate is 64%, According to Williams). No sufficient space for the canine or Impacted canine has passed the mesial side of the lateral incisor , some signs of root resorption, patient age is above 10. In these possible situations, Please refer to an orthodontist immediately. 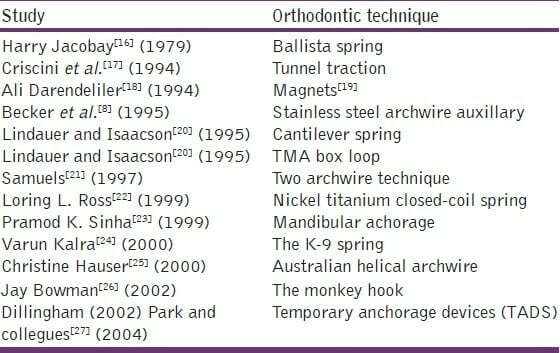 here is a list of Orthodontic techniques used to manage and treat impacted canine, Because this article is targeted towards General Dentists, I will not go into details. 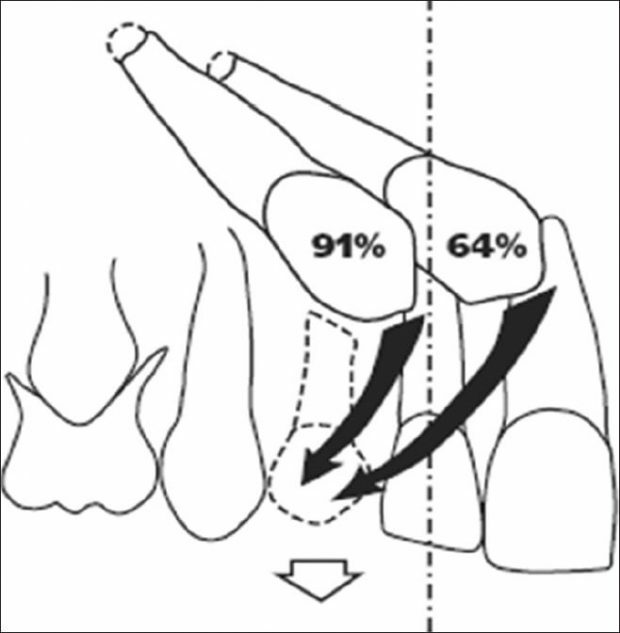 success rate 91% if extraction is done before the canine passes the midline of the lateral and 64% if after. Deciduous Canine , is still fixed and show no signs of movement. No normal Labial bulge or presence of an abnormal palatal bulge. If you see one or more of these indicators, PLEASE DO AN X-RAY, to evaluate the case, because if you intercept it early by a simple extraction you can save the patient so much time, effort and money. J Pharm Bioallied Sci. 2012 August; 4(Suppl 2): S234–S238. Link. Ranjit Manne, 2012, Dental science: Impacted canines: Etiology, diagnosis, and orthodontic management. Link.